TURTLE TOTS &mdash; Young actor Bobby Coleman checks out a few tiny turtle tots while filming a scene from the upcoming film "The Last Song," based on Nicholas Sparks' latest novel. In the film, Miley Cyrus' character Ronnie finds a turtle nest and vows to protect the eggs from raccoons and other intruders. The crucial scene in which newly-hatched loggerhead turtles make their way into the ocean was originally slated to be done with CGI, but at the last minute, the filmmakers decided to use live turtles. The 24 hatchlings that made their film debut in THE LAST SONG arrived on set courtesy of the Georgia Department of Natural Resources and were allowed to make their way out to sea. The two-inch-long hatchlings will eventually reach three feet in length and weight up to 300 pounds. Based on best-selling novelist Nicholas Sparks' ("A Walk to Remember," "The Notebook") latest novel, THE LAST SONG is set in a small Southern beach town where an estranged father (GREG KINNEAR) gets a chance to spend the summer with his reluctant teenage daughter (MILEY CYRUS), who'd rather be home in New York. He tries to reconnect with her through the only thing they have in common - music - in a story of family, friendship, secrets and salvation, along with first loves and second chances. The film is directed by Julie Anne Robinson from a screenplay by Sparks & Jeff Van Wie. The film hits U.S. theaters on March 31, 2010. For more information and images (including this photo), check out wdsfilmpr.com. 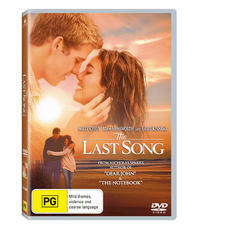 The Last Song is available on Disney DVD 4 August.